So you’ve put all-nighters for the sake of passing exams, assignments, or maybe graduating. You feel like you deserve to treat yourself, maybe by travelling. However, now that you’re an adult (or at least feel like one usually when you’re really close to graduating), you feel somewhat responsible on your spending. Well, here are some tips on travelling on a budget. Ever wonder which destinations are the cheapest from your departure point? Look on Skyscanner where you don’t have to know where you want to go! Simply fill in the departure point and choose “Everywhere” as the arrival point. You’ll get many destination choices ranging from cheapest to most expensive. Even better, you don’t have to know when exactly you want to travel! Select “Whole Month” and you’ll see the ticket prices of each destination for every date of the specified month. Similar websites are Momondo and Cheaptickets. If you want to compare price differences between flights, trains, and buses all together, check Goeuro, as it sometimes significantly differs from one another. 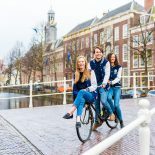 This website displays student-budget options like FlixBus and other fancy ones as well. For local trips, Spoordeelwinkel provides monthly coupons for trains, popular sites, and overnight stays in various cities in NL. One time they even offered a coupon for travelling from the Netherlands to Antwerp, Belgium, for 25 Euro (return). Carpooling can also be an alternative. Blablacar connects drivers and passengers who are willing to travel together between cities and share the cost of the journey. An important tip is to do things as a group if possible, as you will most likely get better deals. Regarding acommodations, Airbnb is a way to go — obviously, but Booking is still worth a look as cheap hostels can be found there too. There are also last-minute hotel deals on HotelTonight. If you’re planning on taking a bus or a train, choose a direct one that departs around midnight and arrives in the morning to save on accomodation. This entry was posted on June 12, 2018 by Nadya Naulita in Nadya, Travel, Uncategorized and tagged studyabroad, Tips, travel.